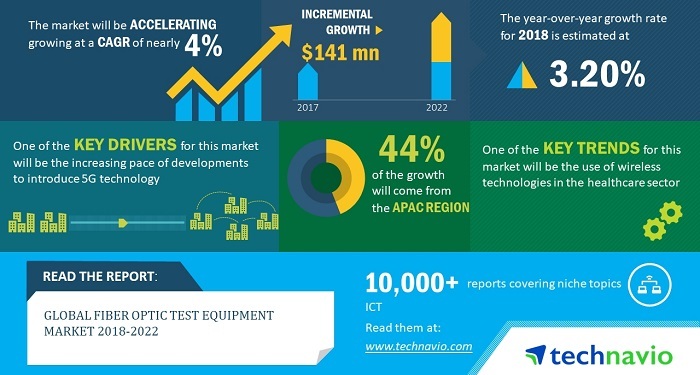 According to a Technavio market report, the global fiber optic test equipment market is expected to accelerate at a CAGR of nearly 4% during the 2018-2022 period. The increasing pace of developments to introduce 5G technology is one of the key factors triggering the growth of the market. The report titled ‘Global Fiber Optic Test Equipment Market 2018-2022’ provides an in-depth analysis of the market in terms of revenue and emerging market trends. It also includes an up-to-date analysis and forecasts for various market segments and all geographical regions. 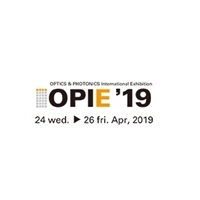 The market research analysis categorizes the global fiber optic test equipment market into applications which include telecommunications, data centers, fiber TV, aerospace and defense, automotive. In 2017, the telecommunications segment accounted for 65% of the global market and is projected to reach 66% by 2022, exhibiting almost 1% increase in market share. The use of wireless technologies in the healthcare sector is an emerging trend in the fiber optic test equipment market space. The applications of the internet are increasing in different verticals. Recent technological developments have led to the use of wireless technologies, such as IoT, in the healthcare sector. The market is witnessing the evolution of various concepts, which use wireless technologies. Internet connectivity helps consumers to get information about various medical services, including chronic disease management, treatment support, disease surveillance, and epidemic outbreak tracking.